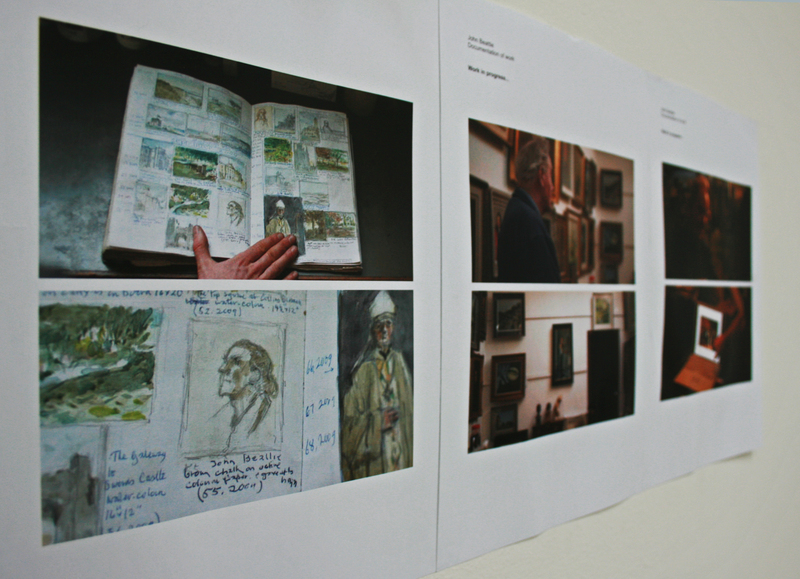 John Beattie is currently an artist in residence at the Irish Museum of Modern Art, Dublin. In an essay written in 2007, Dr. Christia Mia Lerm Hayes described John as an artist who “will always remain a painter but never ‘paint’”. When I asked him if he agreed with this description of himself he said “at the time this was written, yes”; that although he has a background in painting he found that through his MA he began to embrace a more “performative element” to his work. This progression happened naturally for John. He said that when he was a painter there was always a curiosity about the maker; he thought about the performative elements of the paintings – where they were made, how they were made and the artist that made them. This subsequently led him to his research on ideas and romantic perceptions about the artist, ideas about studio, and the relationship with the audience. He also says that process is a very important element in his work. John describes his work as “process-based” and “context specific” but he continuously questions what ‘process’ means. He went on to animatedly ask, “What is process? Is it the context in which you make the work? Are you taking about how you make the thing and how you document it?” He told me that he has been reading a lot on the subject recently and he spoke about Martin Heidegger’s The Origin of the Work of Art. This article, written in the 1930’s, questions the source of an art work and the meaning of ‘things’ – Heidegger refers to artworks as ‘things’. This quote started John thinking about a certain approach to work. It made him think about how he worked, and about the context and content of the work. He became interested in the idea of authorship. He also mentioned his interest in Walter Benjamin’s ideas about production, representation and the role of the artist. 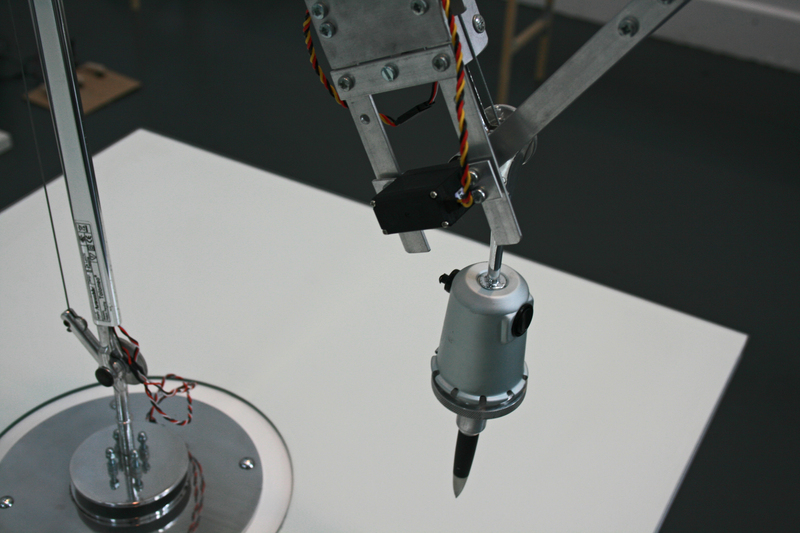 The Artist Studio Series, 2011, is a minimal work; during his residency at IMMA John took his studio table and lamp, which he acquired from the museum, and refabricated it into what he calls a “sculptural drawing tool”. This was wired to a control panel that John controlled from his studio. The lamp is clean and clinical and this drove the aesthetic of the work. To control it he had two monitors in his studio connected to four cameras in the gallery. What he sees from the studio monitors is what is seen from the perspective of the pen. It was important for him that he was in the studio controlling the work, and that it be read as an intervention into the gallery space. It was very relevant for the audience to know that this work happened from the studio. I asked him what was his reason behind using a lamp and changing it into a totally different device. He said that the lamp and table he used were in his studio when he started the residency – he felt they were just normal studio objects, a lamp and a worktable, and why couldn’t studio objects be as much a part of the art as anything else? With the pen-lamp drawing tool he wrote on a piece of paper “If the art…” which is the beginning of the quote from LeWitt. He enjoyed the openness this small extract of the quote presented the audience with. 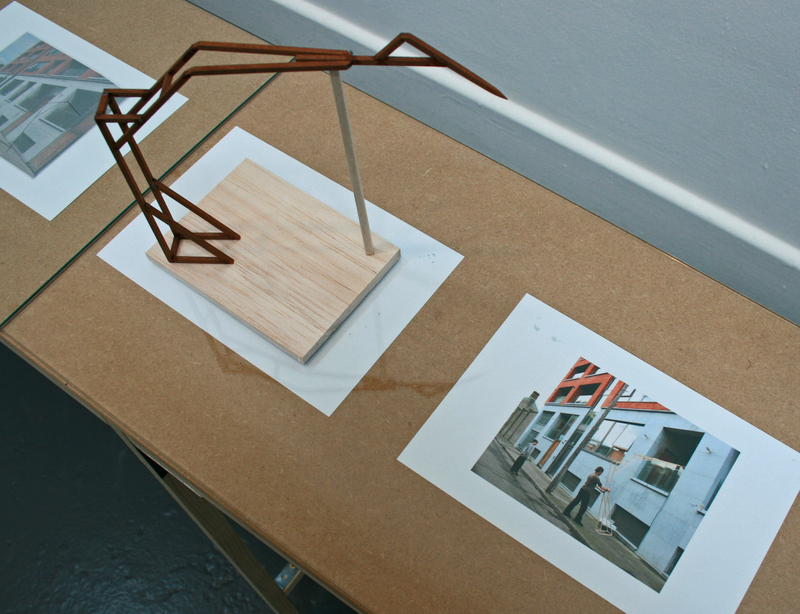 This extract was presented alongside documentation of how the piece was done. John said that it was important that it was presented simply and subtly, regardless of the complex nature of how it was made. The reason this piece is part of his ‘Artist Studio Series’ is because he feels the ego, the persona of the artist, is present without the artist himself being present. The aura of the artist at work can be felt. There is an intriguing curiosity about the artist – how and why would someone do this? Why would they make something so complex to get to something so simple? There is a dialogue created between the audience and John’s work. John says that his methods of working change all the time but he does have a fundamental system to how he approaches work. With a work called (Ex)change Series, done in 2009, he uses a similar approach to that of Artist Studio Series, 2011. When John had a studio at Fire Station Artists’ Studios, there was a building of modern apartments nearby which were across the road from an older inner city residential area. John wanted to “create an exchange between the two spaces”. Through an elaborate drawing process he planned to swap the new with the old and the old with the new. He designed specifically crafted “sculptural drawing tools” for this elaborate drawing process that would reach up from the street and into a living room in each of the buildings. A camera at the end of the tool showed John, who stood on the street, what he was drawing – which was an image of the living room in one building drawn onto a small canvas board which was on a table in the living room across the road, and vice versa. He specifically said that this was not a “live” performance piece. The performative element is definitely a major part of the work for him but how that is carefully controlled and documented – and that documentation becoming the work – that’s more important for him. 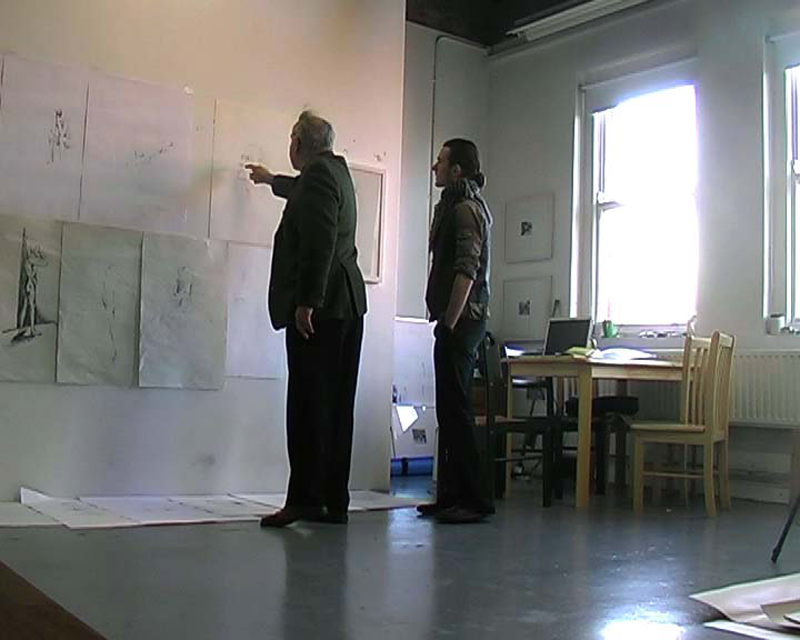 John showed this work as a presentation of both the research and drawing, he likes the fact that this was not a grand piece – it is the process and how the audience can engage with this process and understand the content of the work that is important to him. John has various group shows this year with a solo show next year. For these exhibitions he said he wants to come out with “something completely new, completely different, but by using entirely the same processes”. For the past four years he has been developing a new body of work which he termed “performative research”. This is through an attempted collaboration with the Irish painter Tom Ryan PPRHA, born in 1929. Before Tom agreed to work with John he asked him to do a self-portrait, so as to prove his skill in the traditional sense. Tom was pleasantly surprised when he found out that John could actually draw! John spoke about the fact that their relationship has become like that of a ‘Master and Apprentice’. He says that it’s curious that he has come back to the traditional; he feels like he has gone through the point of challenging painting and romanticism, the creative process and notions of the artists’ studio and has now come a full circle back to traditional methods, embracing romanticism. 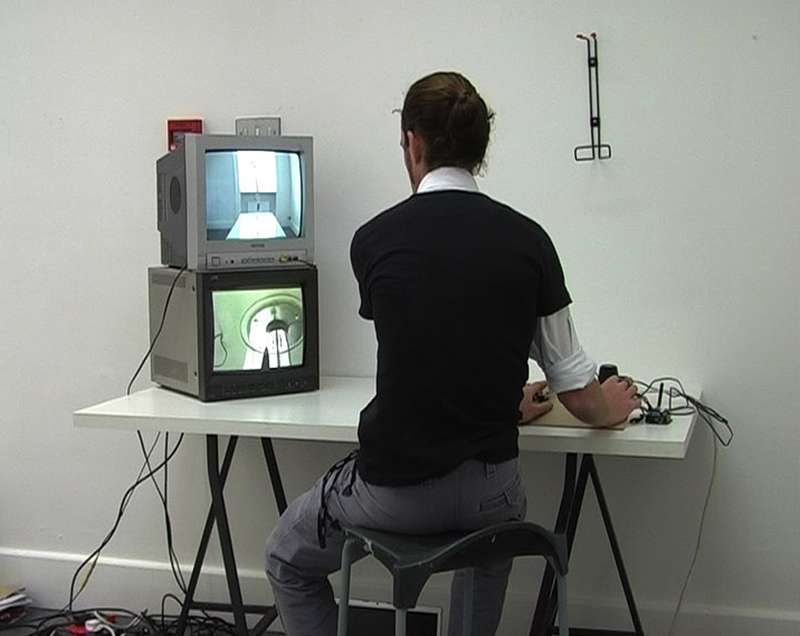 The project with Tom Ryan has consisted of numerous studio visits, formal and informal interviews, drawing, 16mm film, HD Red cam video, and will be represented through a solo show 2012/13. Well done! Very appropriate. It seems John Beattie is probably the most relevant artist to consider (in your continuing artists’ studio project) in relation to artistic process and the ‘free’ space of the studio; in counterpoint to the rigidity of the gallery or public setting for the display and experience of art. Thought provoking stuff; keep up the good work!